My feelings remain the same! Art–how do I love thee? Let me count the ways: I love flowers and paint and textures. I love bling and baubles and buttons. I love masking and mists and layers. I love inks and gesso and gelatos. 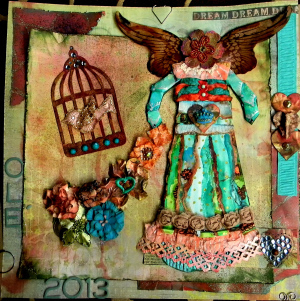 I love stamps and stencils and paper. Oh how I love paper. I love to look at it, I love to cut it into shapes, I love to tear it and place it just so. I love all of it’s many colors and designs, and how some is sparkly. Sparkly is especially nice. There is a paper for every artistic situation. There is bold paper, demure paper, gossamer thin paper, thick and chunky paper, paper with glitter, paper with fibers and paper that you can see through. There is paper made from other pieces of paper. Thank you Jean! Look forward to seeing you in 2016! Hello Pauline! Thank you for your sweet comment. I hope all is well with you. I’m making art whenever I can.